I’m dancing on the grave of Microsoft’s original Surface tablet, and I feel no remorse. It’s hard to feel sad; it was a beautifully crafted ten-inch tablet that ran a crippled version of Windows. It was awful. Now it’s dead, and I’ve got a way better tablet. I’m so happy. It’s a cheaper, 10-inch Microsoft Surface tablet; complete with pop-out kickstand, an awesome flip-out keyboard cover and real stylus support, which runs full Windows 8.1 in spite of not having a “Pro” tacked onto the end of its name. The Intel Atom x7 CPU is less powerful than the chip in Microsoft’s flagship tablet, but it’s still a real computer capable of running all your normal, legacy desktop Windows apps. In other words, it’s a low-end Microsoft Surface you might actually want to buy. The Microsoft Surface 3 is more than a gravestone forthe broken, limited husk of an operating system that was Windows RT (the brains of that busted old Surface I mentioned earlier), it marks Microsoft’s entry into a new market of computers: small, thin, lightweight machines powered by Intel Atom and Core M processors. It’s an emerging category with a handful of surprisingly powerful tablets, tiny HDMI dongles and media center PCs and yes, even Apple’s new Intel Core M powered MacBook. The Surface 3 lives in the middle of all of them: more powerful than the lowest-end devices, but way cheaper than Apple’s new head-turner. 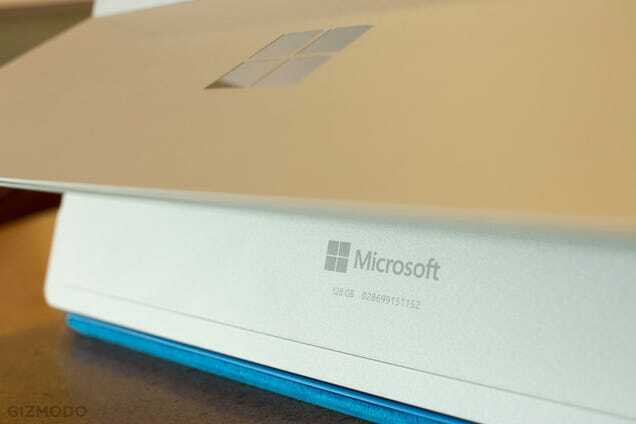 Remember the thin, matte aluminium chassis of last year’s Surface Pro 3? The slightly angled edges, that classy kickstand and the more natural, right-aligned Windows hardware button? Take all that, shrink it down to 10-inches, make it just a hair thinner (0.34-inches) and you have the Microsoft Surface 3. It’s a dead-ringer for Microsoft’s flagship tablet, but with a few subtle changes that both improve and worsen the design. Don’t worry, almost all of the good things are still here. The full sized USB 3.0 port that sets the Surface tablets apart from other Windows slates still lives on the device’s right edge, as do the standard 3.5mm audio jack and a Mini DisplayPort plug. Peek under the kickstand to find a microSD card reader. There’s also a mundane change here, but it has amazing ramifications: Microsoft has ditched its proprietary charging adapter in favour of a standard-issue Micro-USB port. That’s fantastic: not only does it mean that the Surface 3 is the first Microsoft tablet that can be charged with a standard cable, but it also means that a cheap OTG-adapter can make it the first Surface with two usable USB ports. Need to transfer data between two USB devices without first copying them to the tablet’s internal storage? With a simple adapter, now you can. The screen is big (for a tablet), bright and beautiful. It’s a 10.8-inch display with a 3:2 aspect ratio, which means it’s a little thicker than your average widescreen panel. The extra pixels are great when using the active Surface Pen stylus (more on that later), but Windows and text can look a little small if object scaling isn’t set right. It’s easy to adjust in settings, but every Windows convertible I use leaves me wanting for a window-scaling hotkey combination that doesn’t exist. At least the screen is gloriously bright: I was usually perfectly comfortable at less than 50 per cent brightness, and never needed to pull it above 70 per cent. Nice. Not everything is better, though. The Surface 3’s kickstand is a half-step backwards. Last year’s Pro 3 model was a high-resistance hinge that could be used in almost any position. It opened up the Surface to far more use cases, making it easier to use in one’s lap, while lying down and in a myriad of odd sitting positions. It was a versatile evolution on the one and two-stage kickstand hinges featured in previous models. In the Surface 3, it’s gone. Instead, the tablet has a three-stage kickstand... which is good, but not optimal. With narrow, medium and wide settings, I definitely found it comfortable for desktop, lap, and tablet/drawing use. It even props up nicely if you like to cross your legs. But if you ever need to adjust the screen angle just a teeny bit... you just can’t. The Surface Pro 3 billed itself as “the tablet that can replace your laptop.” The regular ‘old Surface 3’s tagline is a little less ambitious. It’s “the best of a tablet” that “works like a laptop when you need it.” I need it to be a laptop almost all the time, so I clicked-in the Surface’s Type Cover and tossed it onto my lap. To be honest, I was genuinely surprised how great using the new keyboard cover feels. The keys are soft, both in texture and landing. There isn’t much travel distance in the keys, but there’s still enough resistance and tactile click to feel reasonably heavy and satisfying. The keys are fairly wide despite the cover’s limited space. It actually feels good to type on. For me, this works. It’s not as nice as a “real” laptop keyboard, but it didn’t leave me wanting for one either. I do think the type cover looks a little cheap, though. The fabric cover and coloured keys are fine, but the thin LED backlight barely leaks through the space between the keys. To me it looks like a light-leak, like it isn’t supposed to be there. It is, and the backlight can be turned off, but I kind of hate it. I’m sure my opinion will change the first time I need to type in a dark room. Still, with the Type Cover attached the Surface 3 is passable as a laptop. A magnetic bar at the top of the keyboard lets it huddle up close against the screen, snapping it up against the glass and giving the Surface the illusion of a proper hinge. It felt authentic enough that I repeatedly reached forward to adjust the “angle” of the screen, only to find myself at the mercy of the limited three-stage hinge. The realism occasionally caused other problems, too; ever pick your laptop up by the corner of its keyboard? That doesn’t work so great when the keyboard is detachable. So it can feel like laptop “when you need it,” but can it perform as one? Um, actually, yes. Yes it can! There isn’t a dang thing in my regular Gizmodo work day the Surface 3 wasn’t able to handle. Chat clients? No problem. A couple of dozen active Chrome tabs? Sure. Multiple files open in Photoshop? Surprisingly, yes (though it does take a minute to load). The one thing it couldn’t do was handle my workload for extended periods of time: Microsoft says the Surface 3 is rated for 10 hours of battery life, but I got less than half of that in my practical tests. Gizmodo’s standard rundown test did a little better: just over six hours of constantly refreshing chrome tabs, busy Twitter and email feeds and a full-screen streaming 1080p YouTube video. OK, I lied: there’d one other thing the Surface 3 can’t do well. It can’t game. I knew it wouldn’t, but I just can’t resist installing Steam on every PC that crosses my desk. It was a waste of time: modern games (Tomb Raider 2013 and Borderlands 2, specifically) wouldn’t hit a playable framerate even at their lowest graphical settings and drastically reduced resolution. Older games could be coaxed into working (Fallout: New Vegas can be run at lower resolutions), but it’s not really worth the effort. If you have to play games on the surface, stick to casual Windows Store games or low-requirement indie titles. The Surface 3’s processor does have a little graphical oomph though: the Atom x7 CPU is based on Intel’s new “Cherry Trail” architecture, which champions improved graphics processing as a key feature. It’s not enough of a boost to play games, but it helps out in other areas. Photoshop is completely usable. Windows and apps load with quick, smooth animations. The Surface 3 can even mirror streaming video to your HDTV at a watchable framerate; something we’ve seen some Bay Trail-based tablets and Core M machines struggle with. I imagine that the upgrade GPU capabilities are also why the Surface 3’s stylus support is so smooth. It’s not the first Atom-powered tablet I’ve used to utilize an active stylus (I’m a Dell Venue 8 Pro user, after all) but it’s the first I’ve seen that uses it well. Microsoft’s Surface Pen glides across the tablet’s screen with no perceptible lag, even in heavier programs like SmithMicro’s Clip Studio Paint (Manga Studio 5) and Photoshop. I don’t know if it’s powerful enough to handle the workload of a professional artist, but it was good enough for me to doodle up an awkward moment I had with my wife last weekend. Compared to my crummy Dell Venue 8 Pro, drawing on the Surface 3 was nothing short of luxurious. The stylus did what I wanted without glitching out. My drawing app didn’t hang or stutter. The tablet’s built in kickstand reclines to a low, slanted position perfectly suitable to amateur cartooning. I honestly expected stylus support to fall flat, but it didn’t. Ditching the keyboard for the Surface Pen also got me to start using the tablet as an actual tablet, and again I was surprised. The Surface’s built-in kickstand mitigates a lot of the problems I have with larger tablets—it’s not awkward or tiring to hold a 10-inch tablet in your lap when the device holds itself up at the perfect angles for lazy couch web-browsing. I still wish the Surface 3’s kickstand had more than just three positions, but just the existence of a usable kickstand is a game changer for me. I can use this. – The tablet’s buttons are in the perfect locations: the Windows key is on the right side, matching the location of Windows 8’s “charms” bar, and the power and volume buttons are on the top edge. They’re easily accessible when the tablet is being used as a “laptop” and fall perfectly under my fingers when I’m using it in portrait mode. Fantastic. – I love the magnet built into the Type Cover that “snaps” it to the edge of the tablet. It props the keyboard up at a slight angle, adding stability and comfort. – I can charge the Surface with any microUSB dongle in my house. Death to proprietary connectors. – I’m not a fan of tablet cameras (seriously, shoot your holiday photos with something better) and the Surface 3’s shooter is mediocre at best. Medium-brightness scenes photograph OK, but the sensor just falls flat on bright colours and surfaces. Meh. – The Type Cover’s keyboard is great, but the trackpad feels cramped and small. – I love the Surface Pen. I hate that there’s no place to stow it when it isn’t in use. Do you have £420 burning a hole in your pocket? Do you ache for a surprisingly capable Windows tablet? Don’t buy it. What? Yes, you heard me right. But if you have £500 burning a hole in your pocket… then maybe. Maybe buy it. Let me be clear: The Surface 3 starts at £420 for the basic version, which only comes with 2GB of RAM and 64GB of storage space; that worries me a lot. I saw the fluid performance I described with the £500 version, which comes with 4GB of memory and 128GB of storage, which is more like what you’d expect to find in a £500 laptop. That extra £80 feels like a no-brainer, and so the £500 version is definitely where you should start. But even at £500, you won’t be able to replace a laptop with a Surface 3: you’ll need an optional keyboard, which costs £109 more. Want a stylus? That’ll be another £44.99. In other words, the whole package will cost you about $800, which just so happens to be how much you’d pay for a Surface Pro 3, which comes with an even faster Core i3 processor… but again, you’ve got to shell out more for the keyboard or stylus there too. And once you’re committed to spending £650 on a computer, well… there are lots of other options. For £650, you can get a sleek, thin laptop a with more powerful processor, more ports, and better battery life, like the Dell XPS 13. Even so, I can’t help but love the Surface 3. It’s powerful. It’s extremely well built. It’s beautiful, as computers go. I can draw on it. It makes way more sense to use than most other detachable tablets. That handy kickstand, extra screen real estate, and those well-positioned magnets and sensible ports add up to a product that feels great to use. But it’s just a little too expensive for what you get right now.